PHILADELPHIA — This was no time for Ben Simmons to get cute, not the moment to be too cool to sweat, and he knew it, even if he wouldn’t say it. His words about the harsh Philadelphia fans only set the stage for a performance that ranks as perhaps the most impactful of his young career, providing a blueprint for how he and his talented teammates can thrive if they want to keep playing 30 days from now. Simmons pushed and attacked and pushed some more as his 18-point, 12-assist, 10-rebound outing evened the Philadelphia 76ers’ first-round series against the Brooklyn Nets in a 145-123 rout at the Wells Fargo Center. 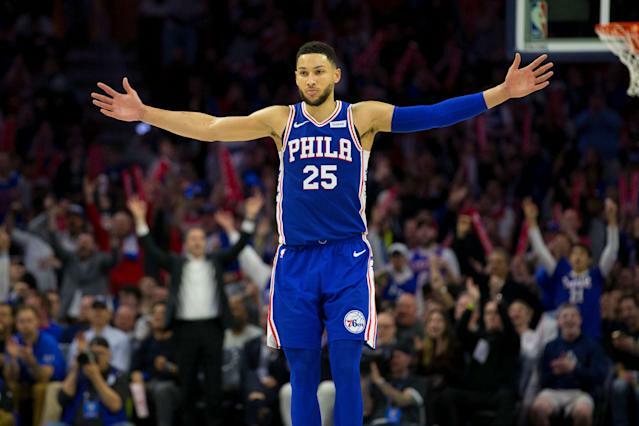 Perhaps a nod to Allen Iverson, who was courtside, Simmons cupped his hand to his ear and played to the crowd after a frenetic third-quarter blitz that put the game out of reach. When you think of the tantalizing highs this group can reach — and the depths it seems more than capable of hitting — it all seems to come back to Simmons, his energy and his impact on a given night. Sure, there were strategic adjustments from much-maligned coach Brett Brown, and getting James Ennis III back from injury certainly helped, but with Simmons scoring or assisting on six of the 76ers’ first nine baskets, he took a lot of pressure off his teammates in what could have been a tight, emotional environment. On Saturday, Simmons was Casper the Friendly Ghost. On Monday, he looked like an apparition, dashing from one end to the court with such swiftness it seemed as if there were more than one No. 25 wearing blue. He helped rescue JJ Redick from his Game 1 disappearing act, assisting on four early baskets. When Simmons attacked, the 76ers followed and ran to the open spaces for passes only he could see, and his 10 rebounds jump-started the transition game. Tobias Harris scored 19 and didn’t look as out of place as he did in the opener. If Joel Embiid’s aggressiveness worked against the first unit on Saturday, Simmons’ made the pieces fit for a night. They needed this resounding response, an emotional one befitting a fearful city that was ready to turn on an underachieving bunch. As talented as the 76ers are, a 2-0 deficit would’ve spelled doom for a group with very little connective tissue. That’s why it was inspiring to see Simmons getting down and dirty with his aggressiveness, especially on defense against D’Angelo Russell and Spencer Dinwiddie. The fact that he can’t and won’t shoot doesn’t make him ineffective. It merely means he has to exert that much more effort in doing everything else to justify keeping him on the floor. He attacked the open space the Nets left him. He made them feel him. “Ben's ability, driven through really aggressive mentality, connected a lot of the dots through the defense and whatever points we had,” Brown said. Embiid (23 points, 10 rebounds) got going to start the second half, helping push a one-point lead to a nearly 20-point advantage six minutes later. But he didn’t feel the need to dominate the ball and the attention the way he did in the Game 1 loss. He ran the floor and fed off his point guard, and everybody else followed suit, putting up a 50-piece in the quarter that ended any notion of the Nets taking a 2-0 lead back home. In the long term, the 76ers’ dreams of having the East run through Philly will always hinge on Embiid first, then Simmons. But in the present, Simmons’ limitations make him more valuable. Because running the offense through Butler for large swaths only illuminates how useless Simmons is without the ball. Winning this series won’t be an indication of the 76ers’ growth — not in the way they surprised a more experienced bunch in Miami last spring — because it’s hard to screw up a hand when you have the four biggest face cards. Sometimes talent simply wins out, and the 76ers won’t have to make any excuses for it. But for them to advance beyond the semifinals, that’s a battle that won’t be so one-sided. They’ll have to play more cohesively, and doing that means Simmons will have to be more than an active participant. He’ll have to lead with activity and consistency. Is he capable of doing that?